Sanosil S006 is a dilute version (1:13) of Sanosil Super 25 Ag. 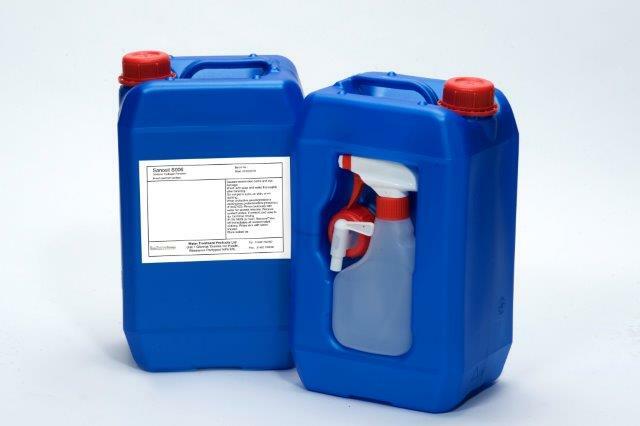 Sanosil S006 is a patented* multicomponent disinfectant. The oxidising agent used is hydrogen peroxide, which is bonded with stabilising agents to form a complex solution. A long-lasting effect is ensured by the addition of silver which acts as a catalyst in trace amounts. The bactericidal effect of silver is based on the fact that the monovalent silver ion binds very firmly to bacterial proteins by a covalent or coordinate bond, and thus inactivates or precipitates these. • Sanosil S006 is extremely effective against bacteria, viruses, amoebae, fungi and algae. This extremely wide range of application ensures ease of use as only one chemical is needed, rather than multiple products with other disinfectants. • Sanosil S006 offers extremely good stability which ensures excellent shelf life. The product remains stable at high water/air temperatures; its effectiveness is even increased at high temperatures. • Sanosil S006 offers long-term effectiveness which provides protection against re-contamination making it ideally suitable for the disinfection of drinking water and wells. • The two main constituents (H2O and Ag) are synergistic which means that the bactericidal effect comes into action quicker and more intensively than if either substance was used on its own. • The combined effects of oxidisation and oligodynamy have created a two-phased product which – unlike other disinfectants – is capable of destroying biofilms. A process which is important in destroying viruses and bacteria that create so-called biofilms as a natural protection. The oxygen separated from hydrogen peroxide destroys the biofilm, thus enabling the silver to destroy the bacteria or virus. Sanosil S006 should be dosed according to the specific application method sheet. Services personnel would be pleased to advise on correct application. Sanosil S006 should be stored in its original container and exposure to sunlight should be kept to a minimum. Sanosil S006 should not be stored with organic materials and acids. Please refer to Material Safety Data Sheets for detailed handling and storage information.